THE last time Ireland faced Denmark in a competitive game, the build-up was overshadowed by the news that Brian Clough was quitting Nottingham Forest. In April 1993, that was big news for Roy Keane, who would go on to join Manchester United that summer and the rest, as they say, was history. Ireland's manager Jack Charlton had sympathy for Clough and bemoaned the chance that he never got a crack at international football. Twenty-four years later, Ireland are back to do business with Denmark and it seems fitting that Keane is part of the set-up working under a Clough disciple. 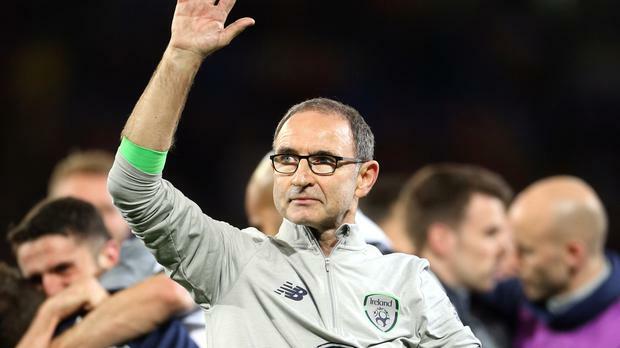 If Martin O'Neill can succeed in getting this group of players to a World Cup next summer, it would be fair to conclude that his brand of management - which was inspired in part by his old boss at Forest - is perfectly suited to the international sphere. The two-legged nature of these play-off encounters brings back memories of his best days at Celtic, the run to the UEFA Cup final in 2003. He is often hailed for his motivational qualities, but the scale of this encounter means that his work should really done for him in that regard. Every member of the visiting squad knows the magnitude of this fixture. This really could be a once-in-a-lifetime opportunity. So it should come as no surprise that O'Neill's game face was on yesterday. As the week of a big match trundles along, he tends to become more guarded. While the Danes were quite jovial in their pre-match press conference, the Irish affair was a bit more of a containment exercise, fittingly enough given the probable approach at the chilly Parken Stadium this evening. O'Neill was happy to take a local question about Nicklas Bendtner and offered a similar response to a query he received in Dublin earlier this week - what was missing was a quip about the player's dubious attendance record. He stopped short of going down an avenue that might have stirred the pot. As Keane alluded to earlier in the week, O'Neill has the ability to say the right things at the right time as the big occasion draws near. He did speak respectfully about the Danes but was reluctant to go along with any theory that this is a tie pitting brawn against brain. "They've got some fine players and so we have we," he stressed. "The young man to my left (Robbie Brady) is pretty decent. They've some big players playing in the major leagues and that's obviously a big advantage but we've overcome these disadvantages in the past. "Yes, they have excellent players who can cause a lot of problems. Eriksen has been playing fantastic football now for around 16 months but he's not the only Danish player who can play. We are going to play to our strengths, play strongly, defend properly when it comes to it and take our chances. That's what we're going to have to do." Cardiff is the template - with O'Neill anticipating early pressure from Age Hareide's side - and it's plausible that he will send out a side with just one enforced change. With Jeff Hendrick and Stephen Ward overcoming injury problems, the main selection dilemma revolves around whether David Meyler's woe opens the door for Glenn Whelan to come back into the side. Given the threat posed by Eriksen in a central attacking position, the choice of defensive midfielder is crucial. O'Neill has said he feels Whelan and Harry Arter can play together again despite their laboured showing in Tbilisi in September and dropping either Hendrick or Robbie Brady back into that role would pose problems and result in a reshuffle further up the park. Hendrick would be the most suitable alternative to Whelan - and it could be argued he is better suited to breaking from deep - but O'Neill likes to use the Burnley player as a physical presence on the right side that can track back. In the absence of Jon Walters, he has a shortage of individuals who can fill that role. Callum O'Dowda and Aiden McGeady offer a different type of service and with the Irish management speaking consistently about how their hosts favour a more direct and physical style, it seems safe to assume that fire will be fought with fire. That will disappoint supporters of Wes Hoolahan with a substitute cameo his likely role - if he even gets that chance. But the first sub option is more likely to be whichever one of Shane Long and Daryl Murphy misses out. O'Neill has favoured the lone striker in away matches and functioned with a diamond and two up top at home. That was his modus operandi for Bosnia when Brady's goal gave Ireland a position of strength. With their middling home form in this campaign, they really do need an away goal tonight to approach the decider with confidence. Selfless James McClean has been the go-to man in that regard in this campaign with Murphy and Long doing a lot of selfless work outside the area as part of their function - the latter is also suffering a painful goal drought. Ireland have still managed to find a way, though, scoring first in every away match in this campaign and remaining unbeaten on their travels as a consequence. "Historically speaking, the Republic of Ireland, even some great players, have not been great goalscorers," said O'Neill. "That doesn't mean we can't score out here. We can. We've got the capability of doing it - the away goal is obviously important. We're just going to go for it. "Now it's easy to say we're going to go for it, but that doesn't mean gung-ho or whatever the case may be. But we need to get on the front foot at some stage." It's stating the obvious that set-pieces will be vital. Shane Duffy is a big player for Ireland in every sense of the word and Brady can unlock doors too. He did so in a very different way in Bosnia. Last night's training session was curtailed because of office blocks overlooking the stadium with O'Neill fearful that observers could be taking note. Hareide's view that Ireland are easy to read suggests that he would have nothing to learn from any spying exercise, particularly as O'Neill can surprise his own players, but the set-piece department is one area where there can be variation. Ireland will have to come out of their shells at some point. Parking the bus at the Parken can only bring a team so far. The pressure of the play-offs brings strong characters to the fore, even if the opposition have stronger CVs. "We had a good team on paper," a great manager once said. "Unfortunately the game was played on grass."